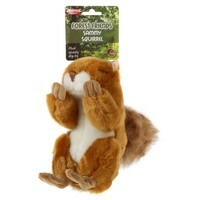 Sammy Squirrel Squeaky Soft Dog Toy is an exciting new toy from Animal Instincts' new collection "Forest Friends". This toy is perfect for interactive games such as fetch and retrieve or just for cuddling. Made from a premium quality ultra soft fabric that is machine washable, Sammy Squirrel is sure to be a hit with your dog. My Staffie X loves this toy. She plays with it every day and it is still INTACT after 3 weeks - a first for her, most soft toys last a few hours. She pulls the fabric off the tail but everything else is standing up to her biting and shaking. Can definitely recommend this.